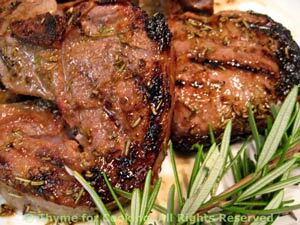 Thyme for Cooking Menus: Grilled Lamb Chops, easy recipes. The Sweet and Sour comes from the marmalade and the vinegar... It's closer to the original Chinese sauce than what one finds on American 'Chinese' buffets. Put all ingredients (except lamb) into a small bowl and whisk well. Spoon over lamb chops and set aside for 15 - 30 minutes. Cook on barbecue grill for 2 - 5 minutes per side depending on thickness and desired degree of doneness (I don't know if that is a word - but you get the idea). Baste once with any remaining sauce. We do ours on a hot grill 2 minutes per side for medium rare. When you think they might be close take one off, cut into center and peak. You can always put them back on to cook more - you cannot undo... When done to your liking remove from heat and serve. Or you can sauté in a hot nonstick skillet for about the same amount of time. Dijon-style mustard lends a bite to these roasted vegetables, not much.... Just a little, to make them interesting. They can be done on the barbecue or in the oven; either way, stir them once or twice. Peel carrots then cut in thirds the short way, then each length in half. 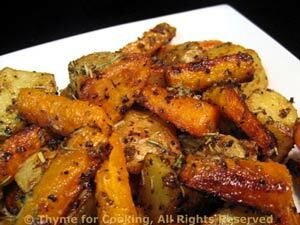 Add potatoes, carrots and toss well to coat.